No items. Your shopping bag is empty. As you are getting to know the wonderful world of TEFL we thought it would be a good idea to answer a few of your questions. The following will give you more information on the many acronyms we love to use in the industry and answers to general questions you may have about TEFL jobs, travelling abroad etc. If we haven't given the information you need please send your query to us and we will be in touch to fill you in. English is taught as a Foreign or Second Language all over the world under many different circumstances and the profession has spawned much specialised terminology. For those who wish to pursue a career in this field we provide the following brief introduction to some of the terminology in common use and the many acronyms that you need to be familiar with. Traditionally, TEFL refers to teaching in non-English speaking countries, whereas TESL refers to teaching in English speaking countries, to non-native speakers living or working there. In practice, though, the two terms are often used interchangeably, and both are covered by the all-encompassing TESOL. "English" is a term that can refer to various dialects, including British English, North American English, and others. Students studying EFL in Hong Kong, for example, are more likely to learn British English, while students in the Philippines are more likely to learn American English. Both these organisations are highly regarded in the field of TESOL/TEFL, and their qualifications are widely recognised by employers and authorities around the world. TESOL Inc. - Teachers of English to Speakers of Other Languages, Inc. Teaching English as a Foreign Language (TEFL), is a term used to describe the teaching of English to non-native speakers in a country where English is not the first language. It is possible for TEFL to happen within English speaking countries, in language schools for example, but teaching tends to takes place in a student's native country. TEFL can be used within state school systems in private language schools or by freelance teachers. Teachers can be either native or non-native speakers. The term TESOL (Teaching English to Speakers of Other Languages) is a term used to describe the teaching of English to non-English language speakers who have moved to a country where English is the first language. The term is used in American English to include both TEFL and TESL. In reality there is very little difference between TEFL and TESOL and they are now commonly used interchangeably. The TEFL acronym is best known in the UK while TESOL is more common in the US, Canada and Australasia. TEFL is traditionally associated with teaching students within their own country where English is rarely the first language. TESOL, however, is more commonly associated with teaching students who have migrated to an English speaking country. CELTA is an initial qualification in teaching English awarded by the University of Cambridge ESOL. The qualification is aimed at people with little or no previous teaching experience. The course teaches the principles of effective teaching and provides a range of practical skills for teaching English to adult learners it also gives you hands-on teaching practice. There are five main units of learning: Learners and teachers, and the teaching and learning context, Language analysis and awareness, Language skills: reading, listening, speaking and writing, Planning and resources for different contexts, Developing teaching skills and professionalism. An external assessor, appointed by Cambridge ESOL, moderates each course. There are two components of assessment: teaching practice and written assignments The course includes a total of 6 hours of practical, supervised teaching practice and four written assignments. one focuses on adult learning; one on the language system of English; one on language skills; and one on classroom teaching. You can take CELTA full time (typically four to five weeks), or part time (from a few months to over a year). Because it is awarded by Cambridge ESOL,CELTA is accepted throughout the world by organisations which employ English Language teachers. The Cambridge CELTA has been accredited by the Qualifications and Curriculum Authority (QCA) at Level 5 on the National Qualifications Framework for England, Wales and Northern Ireland. Each year around 900 CELTA courses are run by around 280 centres, in 54 countries. Each course is audited by an external assessor.Over 10,000 people successfully complete a CELTA course each year. The Trinity CertTESOL course is designed for those with little or no experience of teaching English. It equips trainees with the skills and knowledge needed to take up a first post as an ESOL teacher and gives them a firm foundation for self-evaluation and further professional development. The Trinity CertTESOL qualification will allow graduates to apply for jobs in English speaking countries as well as abroad. Each course runs for a minimum of 130 timetabled hours. Every trainee has to attend a full course and complete all assignments, including teaching practice, to the required standard in order to qualify for the award. A minimum of 15 hours of private study is usually also required. 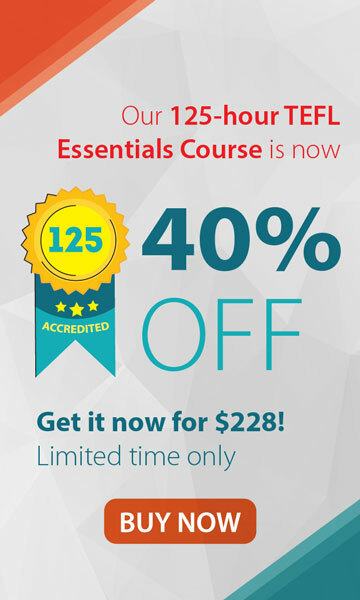 The minimum length of a validated CertTESOL course is four weeks full-time. The longest part-time courses are normally nine months, except where they are integrated into a university BA programme and may run over two years. Over one hundred organisations around the world offer Trinity validated Cert TESOL courses. All course details must be approved by Trinity and a senior member of Trinity's professional staff inspects the organisation and the premises where courses are held. The Teaching Knowledge Test (TKT) is a test from Cambridge ESOL which assesses knowledge of English language teaching methodology and practice. It aims to increase teachers' confidence and enhance job prospects by focusing on the core teaching knowledge needed by teachers of primary, secondary or adult learners, anywhere in the world. TKT gives teachers a strong foundation in the core areas of teaching knowledge needed in the English language teaching classroom.This flexible and accessible award will help you to understand: different methodologies for teaching, the 'language of teaching', the ways in which resources can be used, the key aspects of lesson planning and classroom management methods for different needs. It is ideal for all teachers, whatever their background and teaching experience, and is also suitable for people who would like to teach English but do not yet have a teaching position. The TKT Certificate examination has three core modules. These can be taken together in one exam session or separately, in any order, over three sessions. Each module consists of a test of 80 objective questions, lasting 80 minutes, which require you to select the correct answer and mark this on a computerised answer sheet. TEFL Express is a TEFL/TESOL training provider that offers the highest quality, internationally recognised modular teacher training programmes. We offer a range of training courses including a combination of online, classroom based and live webinar teacher training modules. These can be taken individually or easily blended to suit the needs of each individual trainee that registers with us. There is a choice of practical and classroom based programmes including: an introductory certificate in TEFL, a practical teaching module, and a portfolio creation and assignment writing component combined with a comprehensive online choice of theory and methodology courses which, when combined, create a complete teacher training package. We have been involved in English language teaching and training for over thirty five years and our courses have been written by industry experts. Our investment in training excellence means that you can trust us to deliver one of the best flexible TEFL/TESOL training courses on the market. Every detail has been considered, you'll find that your knowledge and confidence will grow daily as you move through the self-paced courses. Our unique modular programme has been designed to satisfy our own rigorous requirements for new teaching staff, and for this reason, and because we have a deep seated commitment to high standards in teaching, we've spared no effort to ensure that the course is comprehensive, flexible and failsafe. Because our courses have been designed by experts in the field of teaching, training, recruitment and employment, they incorporate all the elements that we know to be important for new teachers. You're provided with a blend of practical and theoretical training modules that can be completed in a time of your choosing. There are a range of career options available to you depending on the blend of courses you opt for. You can go directly into a paid teaching career when you have completed your training or consider a shorter teaching option in the form of an internship contract. Typically these last for 3 - 6 months. Generally speaking, if you're seeking a paid ESL job in Europe or Asia, we recommend a minimum of 120 hours TEFL training, to ensure that you meet employer requirements. Some newly qualified TEFL teachers branch into the world of volunteering to gain experience before setting their sights on a paid position. This can be a hugely valuable experience too. There are simply thousands of teaching positions available every day around the globe. As it's a contract-based industry, schools and recruiters are always hiring. If you'd like a list of TEFL job websites to help with your job hunt, contact the TEFL job team requesting the list be sent to you. TEFL Express graduates are teaching in well-paid ESL jobs all over the world. It's important to point out however, that a teaching certificate isn't the only thing that your potential employers will look for. To get paid work abroad you'll need to make sure that you meet the employer's job requirements and that your application letter and resume are carefully written and well put together. You'll also need to prepare yourself for any interviews that you may be asked to attend. For a detailed guide on how to secure your dream TEFL job check out the Job Hunter's Guide. Upon application to our placement service you will be put in direct contact with an in-country recruitment agent to help you find a great job or internship teaching English. We currently have partnerships in many countries including China, Japan, South Korea, Spain, France, Hong Kong and more. 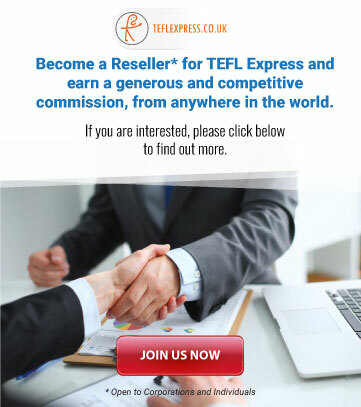 Please note: TEFL Express has no part in the decision making of whether you are successful in your application, this responsibility lies with the recruitment partner that you're applying to. To view current job openings, click here. We also offer a selection of volunteer teaching options. This is a great way of gaining much needed practical teaching experience in preparation for your teaching career and also offers you the opportunity to make a contribution to some great causes. Our organisation has been involved in teaching English and teacher training for over thirty five years. All TEFL Express courses are fully accredited by ACCREDITAT which means that they've been assessed for quality, consistency and high standards. Our partner school Language Link is accredited by the British Council and are members of English UK. Language Link teacher training school is recognised by Cambridge ESOL. Trainee TEFL teachers are supported in a number of ways during your course. The Customer Care team is available for general queries during office opening hours and in addition students have access to an academic tutor for course material support and a technical team for anything IT related. If you attend a classroom course you'll have constant support from a helpful experienced and professional tutor for the duration of your course. The focus is to help you enjoy every element of the course and to fully absorb the range of information provided so that you can progress smoothly and successfully to a practical teaching environment. If you need help on a section of your online course you'll be assigned a personal tutor who will assist you with the modules and offer advice and guidance throughout the course as required. Whichever course you choose, we will ensure that you have the guidance, support and assistance you need to become a successful teacher. Within your personal training account you'll find the online Help Centre which you can access 24/7. In the Help Centre you'll have a huge source of information at your fingertips covering topics that include 'during the course', 'after the course', 'jobs and careers' and much more. Please contact our customer helpdesk if you require further support. We will provide you with details of the career opportunities best suited to your TEFL plans and we'll keep you updated on job openings that are available to you. We'll advise you of job vacancies in your country of choice as they arise and help to ensure that you get the placement you'd like as and when you are successfully trained. To obtain your certificate you need to complete all of the components of your course. Your course is considered complete when you have passed all the units and saved all the pages within your chosen course. You can check if all the online course units are completed in 'My Progress' and if all the units have been passed in 'My Marks'. If you attend a classroom course, you will be marked as a Pass/Fail by your course tutor. When your course is complete, you need to go to the 'My Certificates' section of the Virtual Campus and follow the steps to request your certificate. Once a member of the Customer Care team checks your course work they will be able to approve your certificate request. If for any reason your certificate cannot be approved, a team member will contact you. If a potential employer requires proof that your course has successfully been completed ahead of receiving your hard copy certificate, you can order a 'proof of course completion' letter or a course transcript from your Virtual Campus account. Note that practical webinar or classroom based TEFL course are graded as either 'Pass' or 'Fail' and as such certificates for these courses will simply state 'Pass'. Thousands of TEFL Express graduates are working overseas in well-paid TEFL jobs. Within the Help Centre that is available to all course students in the Virtual Campus, there is a section dedicated to information about jobs and careers. During classroom courses there is time devoted at the end of the course to this topic and you can avail of advice from your tutors who have years of experience working abroad. You'll also find a useful overview of the TEFL job market here. 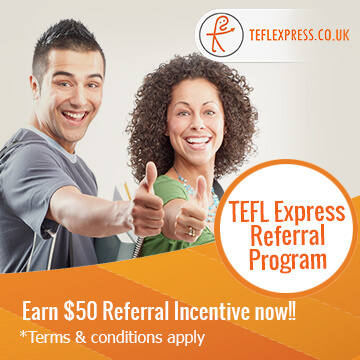 Where can I teach with the TEFL Express certificate? TEFL Express courses are geared for use mainly in non-native English speaking countries and you can teach all over the world with a TEFL qualification under your belt. Will the certificate get me a paid job? Yes - TEFL course graduates are sought after by employers and schools worldwide. To get paid work abroad you'll need to make sure that you meet the employer's job requirements and that your application letter and resume are carefully written and well put together. You'll also need to prepare yourself for any interviews that you may be asked to attend. For a detailed guide on how to secure your dream TEFL job check out the Job Hunter's Guide. The number of hours TEFL/TESOL training taken will equate to one of the following certificate levels and if your certificate was issued prior to 2012 you may see this printed on your hard copy certificate. All of our online courses are assigned a generous 75 day study time as standard. Your study time begins once you click on the activation link within the email you receive after registration. The majority of students have no trouble completing their course within the allotted 75 days, however if you do need more time there are a range of study extension options available for purchase in the Virtual Campus. If your course expires before you purchase a study extension you will not lose the work previously completed. Your course will simply freeze and when an extension is activated you will continue from where you left off. The length of time it takes to complete an online course varies from student to student and will depend on how much time you can dedicate to work through the training units and modules. To complete a TEFL/TESOL qualification you need to have a high command of the English language. If you are not a native English speaker then you should be a fluent speaker, comfortable and confident in written and spoken English. While there are no pre-requisite qualifications for non-native English speakers to take a TEFL Express course, we recommend that you are at least at CAE (Cambridge Advanced English) level. If you're not sure, take this free test. Yes, your account will always be accessible with your unique username and password. When the study time on your course material expires, this will be the only section that is not accessible unless you choose to purchase a 'Course Material Subscription'. These are available for 6 and 12 month periods. Having unlimited access to your account means that you will always have the option to upgrade your TEFL/TESOL training course, purchase downloadable TEFL resources and order additional or replacement copies of your certificate plus much more. When applying for a TEFL job abroad you may be asked to have your TEFL / TESOL certificate Apostilled or notarised. Apostille stamping is a document verification process that is completed by eg the Dept. of Foreign Affairs or the Embassy of a particular country, to show that a document is genuine. Apostille stamps can be issued for Foreign Public Documents. The process is straightforward and details of how to organise an Apostille stamp will be found on the relevant Dept. of Foreign Affairs or Embassy website. A notarised document is a copy of a document that is certified to be a true copy of the original and signed by a Notary Public. A Notary Public is usually a practicing solicitor who is registered as a public officer offering notarisation. You'll be able to locate your closest Notary Public by contacting some solicitor offices in your local area. Having a document Apostilled or notarised is part and parcel of the process of gaining an English teaching job abroad. It's not something to be worried about and thousands of TEFL teachers have completed these steps before you. The key thing to remember is not to delay this process, give yourself plenty of time to complete the paperwork so that your job application process is as stress free as possible. Yes, all hardcopy certificates will have the TEFL Express logo embossed in the bottom right hand corner. An embossed stamp on your certificate allows potential employers to be confident that your TEFL / TESOL certificate is authentic. You can order a hardcopy certificate that is embossed from your Virtual Campus account after successful completion of your course. Yes, on completion of your TEFL/TESOL course a transcript of your modules and marks can be ordered online from your Virtual Campus account. This document will be emailed to you in pdf format and can be used to illustrate the training sections or speciality modules that you completed during your training. The minimum age recommended to take a TEFL/TESOL course is often guided by employer's age preferences. In many job advertisements you will see an age preference stated; however this is not always the case. If an employer states that they require that applicants have a university degree, they will expect the applicant to be a minimum age of 20 or 21 years old. Generally speaking, 18 years old is the minimum age you need to be to gain a TEFL position. It is possible to take TEFL training from 16 years old, if for example you are taking part in a community teaching project or on a volunteer programme overseas. TEFL Express can provide group rates for suitable classroom and online training options. For further information on group training rates, contact us. Younger TEFL teachers will find that summer camp employers are happier to employ them especially between the age of 18 - 25 years. Summer camp contracts are usually 2 - 8 weeks long and there are a huge number of summer camps that run in Europe over July and August. Positions are normally filled by Easter time so January - March is the best time to look for a summer teaching position. A teacher holds a position of respect and authority within a school, for this reason employers will prefer job applications from teachers who can show that they have some life experience and they will also want to make sure there is a suitable gap in ages between the students learning English and the person who is teaching it (unless it is an adult learning class). You can find more information about TEFL job requirements by checking out these job openings. TEFLQ is a term that refers to a diploma-level qualification in teaching English as a foreign language such as DELTA. TEFLI is used in relation to certificate-level qualifications in teaching English as a foreign language such as CELTA, Trinity CertTESOL or equivalent entry-level ESL teaching qualification containing 6 hours of teaching practice. Stay up to date with our newest jobs and the latest TEFL news.